When I first saw this recipe, I was intrigued by its primary ingredient. Chickpea flour sounded so much more exotic than plain old chickpeas, which manage to make their way to my table in various forms on a regular basis. I couldn’t imagine how the knobby little garbanzos I know so well would behave as flour. It turns out they behave quite well. Ground to a fine powder, chickpeas retain their characteristic flavor and pale beige hue, a few shades deeper and warmer than all-purpose flour but not as bright as yellow corn meal or as dark as whole wheat. Chickpea flour is fine and soft, not at all gritty or tough. It is a common ingredient in Indian kitchens, where it often goes under the name of besan or gram flour. In Sicily, it is used in the popular street food panelle, or chickpea fritters. In Italian markets in the U.S. it is often sold as ceci flour. It is also one of the main ingredients in socca, a popular snack in the south of France. 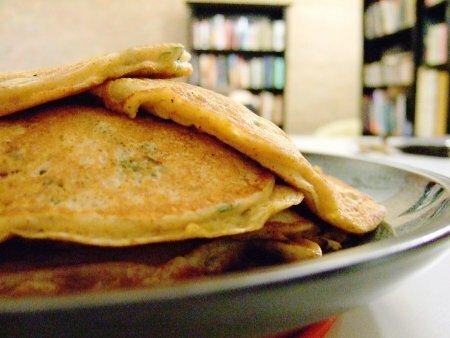 In these curried chickpea pancakes, chickpea flour makes for a satisfying main course. This recipe comes from Peter Berley’s Fresh Food Fast, a cookbook that gets plenty of use in my kitchen. These have more heft than any other pancake I’ve eaten. The eggs and baking powder give them plenty of lift, while the chickpea flour gives them a filling density. My turmeric-heavy curry powder turns them a lovely yellow-orange, but other curry powder blends would likely give them a redder cast, which would be lovely too. The green onions and cilantro fleck subtle bursts of green throughout. Every time I make them, I am reminded of how solidly good these are, and I resolve to make them more often, though for some reason they seem to have a tendency to get lost for a few months before I can remember to bring them out again. But really, I am going to make them again soon. The chickpea flour is the only tricky-to-find ingredient here, but it is, of course, essential. I found it under the name garbanzo flour at a local natural foods store. It is also available through various online sources. The tahini sauce here is a nice touch, but, as Berley says, they are also good with a garlic-cilantro yogurt sauce, and I think they’re even quite tasty unadorned. If you don’t like cilantro, you could substitute flat leaf parsley or a combination of parsley and mint. Then, make the pancake batter. In a large mixing bowl, combine chickpea flour, all-purpose flour, baking powder, curry powder, and salt. In another bowl, mix the wet ingredients–yogurt, eggs, and oil–until well combined. Add the wet mixture to the dry and stir until well-mixed–a few lumps are okay. Stir in the green onions and cilantro and black pepper. In a large skillet or griddle, add a thin layer of canola oil over and heat over medium. With a ladle or a measuring cup, add about a half-cup of batter to the pan and cook until bubbles start to form in the middle, about 2-3 minutes. Flip over and cook for another few minutes until the pancake is cooked through and both sides are golden. You can transfer the cooked pancakes to plate and tent it with foil or keep them warm in a 200°F oven until all of the pancakes are done and you are ready to serve them. You can drizzle with tahini sauce, or leave it on the side for each person to add to taste.